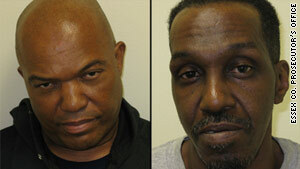 Lee Anthony Evans, left, and Philander Hampton have been charged with murder and arson. New York (CNN) -- Authorities have arrested two suspects in connection with the alleged murders of five teenagers who were reported missing in Newark, New Jersey, more than 30 years ago. Lee Anthony Evans, 56, and his cousin Philander Hampton, 53, were arrested Monday night and charged with five counts of murder witness testimony put the men under suspicion, the Essex County prosecutor's office said. They were also charged with arson. A third suspect, Maurice Woody-Olds, also a cousin, died in March 2008. In a news conference Tuesday, acting prosecutor Robert Laurino revealed that 18 months ago, a witness came to authorities and connected the 1978 arson of an abandoned building in Newark with the disappearance of the five boys. That set off an intense investigation aimed at corroborating the witness' account, culminating in Monday's arrests. The boys, who had become known as the "Clinton Avenue Five," were Randy Johnson, 16, Melvin Pittman,17, Ernest Taylor, 17, Alvin Turner, 16, all of Newark, and Michael McDowell, 16, of East Orange, New Jersey. Allegedly both Evans and Hampton, with the aid of Woody-Olds, lured the five boys at various times into Evans' pickup truck and held them at gunpoint in the abandoned building on Camden Street before setting it ablaze, officials said. Authorities believe the alleged killings were in retaliation for the victims' breaking into the home of one of the defendants to steal marijuana. The remains of the five never were found. "I've been in public life now in Newark for about 15 years," Mayor Cory Booker said at Tuesday's news conference, "and there hasn't been a year gone by when somebody hasn't pulled a flier out with the children's picture on them, looking for them ... [or] where I haven't been in a coffee klatch or in the community where somebody hasn't brought up to me the anguish and the pain of this unsolved murder. We in the city of Newark, though, have not only not forgotten, but we have not given up on the fight against [this] kind of unfinished business or undone justice." Evans was under suspicion when the investigation first started in 1978, but was released after passing a polygraph test. Laurino said the five boys had done odd jobs for Evans in the past. Evans and Hampton are being held at Essex County Correctional Facility on $5 million bail, and are scheduled to be arraigned Wednesday morning at Veterans Court House in Newark, officials said.